Background: A new vegetable cultivated in North Iran (Guilan and Mazandaran) is Cucurbita pepo. C. pepo peel is often removed from the fruit before use. Thus, antioxidant activity of C. pepo peel could be an interesting topic for research. Methods: In this research, antioxidative activity of peels from C. pepo cultivated in Behshar and Amol areas (in Mazandaran province, Iran) was investigated. For this purpose, water-ethanol extracts of C. pepo were prepared by common and ultrasound-assisted methods. Antioxidative activities of the extracts were investigated by three methods including β-carotene bleaching assay, 2,2-diphenyl- 1-picrylhydrazyl (DPPH) radical-scavenging assay and rancimat test. Moreover, total reducing capacity (total phenolic compounds) and tocopherols of the extracts were measured. Results: C. pepo extract was better than tert-Butylhydroquinone (TBHQ) in β-carotene bleaching assay and DPPH radical-scavenging assay; while the opposite was the case for rancimat test. Moreover, antioxidative power of peel from C. pepo cultivated Behshahr region was better than that of Amol region. Ultrasound waves promoted extraction of phenolic compounds, too. 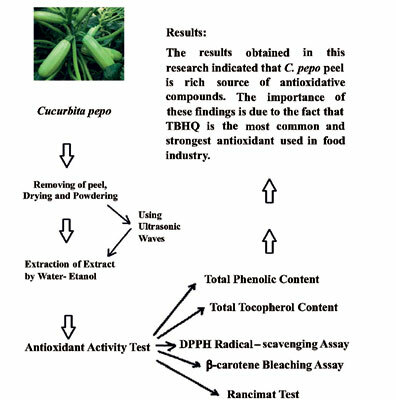 Conclusion: The results obtained in this research indicated that C. pepo peel is rich source of antioxidative compounds. Keywords: Cucurbita pepo, peel, antioxidative activity, phenolic compounds, water-ethanol extracts, ultrasound waves. Keywords:Cucurbita pepo, peel, antioxidative activity, phenolic compounds, water-ethanol extracts, ultrasound waves. Abstract:Background: A new vegetable cultivated in North Iran (Guilan and Mazandaran) is Cucurbita pepo. C. pepo peel is often removed from the fruit before use. Thus, antioxidant activity of C. pepo peel could be an interesting topic for research.